What does an animal assisted therapist do? Would you make a good animal assisted therapist? Take our career test to find out how you match with this and over 800 other careers. What is an Animal Assisted Therapist? 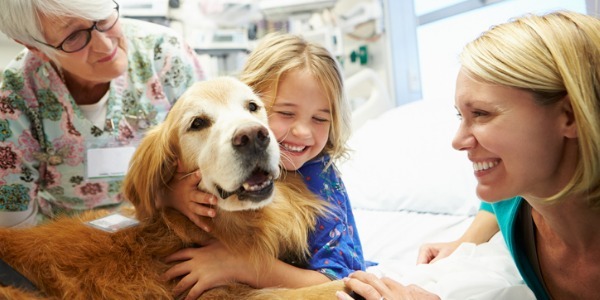 An animal assisted therapist typically works with a therapy dog in a variety of clinical settings, from nursing homes to hospitals. They help clients with a multitude of things they need help with, such as improving self-esteem, help for anxiety and post-traumatic stress disorder, and developing social skills. If the client does or says something that the animal doesn't like, the animal will react negatively immediately, and if the client does something positive that the animal likes, the animal will react positively immediately. This teaches the client to practice social and caring skills in a simpler way than with a human. 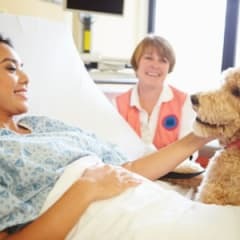 A study has shown a significant drop in stress hormones and adrenaline and an increase in health and social inducing hormones such as oxytocin, dopamine and endorphins after 20 minutes with a therapy dog. An animal assisted therapist can help children with behavioural issues and the elderly with dementia and depression. With the presence of the therapy animal, a purely nonjudgemental space for individuals to work out their problems is provided. Are you suited to be an animal assisted therapist? Animal assisted therapists have distinct personalities. They tend to be social individuals, which means they’re kind, generous, cooperative, patient, caring, helpful, empathetic, tactful, and friendly. They excel at socializing, helping others, and teaching. Some of them are also investigative, meaning they’re intellectual, introspective, and inquisitive. Does this sound like you? Take our free career test to find out if becoming an animal assisted therapist is right for you.